Pride of Wales Tartan Ribbon (proper name, if slightly confusing, is "Pride of Scotland (Wales) Tartan Ribbon") is one of a range of 11 tartans designed by a Scottish highlandwear company, keen to promote new tartans aimed at the kilt hire market. 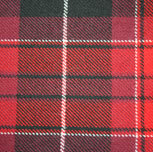 Each tartan in the range is called Pride of Scotland, followed by the variant name - in this case "Wales". The Pride of Wales Tartan Ribbon features the red of Welsh dragon, with the black representing the Welsh mountains and the country's proud mining heritage. I M P O R T A N T . . . some confusion has been caused because of the name registered for this tartan. This particular tartan has been successfully registered with the Scottish Tartans Authority as "Pride of Wales" but is not the same as the Pride of Wales tartan offered by the Welsh Tartan Centre. The Pride of Wales tartan offered by the Welsh Tartan Centre is not produced in ribbon although we hope they will agree to us producing this popular tartan in ribbon before too long. In the meantime, for an alternative to the Pride of Wales offered by Welsh Tartan Centre, please click here. It may be worth taking a few seconds to check this, so that you know you're ordering the correct version of Pride of Wales Tartan Ribbon. Pride of Wales Tartan Ribbon is available to buy in 10mm (3/8"), 16mm (5/8") and 25mm (1") widths on 25 metre (approx 27½ yard) reels. The Pride of Wales Tartan Ribbon sold by tartan-ribbon.com is top quality, authentic tartan ribbon as certified by the Scottish Tartans Authority. As you will see, the prices of all Pride of Scotland Tartan Ribbon are considerably higher than most other tartan ribbon. This has to do with licensing arrangements and the price set by the manufacturers and is, unfortunately, outwith our control. We believe our Pride of Wales Tartan Ribbon is the most competitively priced you'll find but, where possible, we have also shown better priced alternatives. Welsh tartans tend to be a mixture of family tartans (in the Scottish tradition) and county tartans (the Irish tradition), so it be a case of where you come from as much as what your name is. 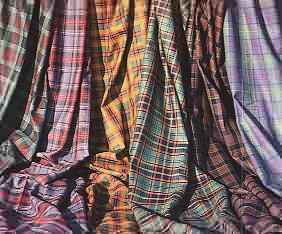 Welsh tartans were not catalogued or registered to the same degree as Scottish tartans, so it unlikely that many modern Welsh tartans can claim accurate descent from the more ancient Welsh tartans. The existence of Welsh tartans reinforces the fact that there was a common, shared Celtic culture between the peoples of Ireland, Scotland, Wales, Cornwall and other parts of Northern Europe.